(NaturalNews) With water being our most precious commodity, you would think that government officials would be keeping very close tabs on its usage, especially in states like California where drought conditions are now entering their fourth year. However, Governor Jerry Brown is just now cracking down on state municipalities, attempting to get them to cut back on their water usage by 25%. With California's agricultural industry being one of the largest consumers, and almond growers alone using 1.1 trillion gallons of water a year, it's easy to understand why the public outcry would be directed at Big Ag. These farmers need to be held accountable for their usage when growing our food and should be penalized when they go over their limits! I'm not giving up my long, hot showers and garden for a high-priced bag of almonds! Hold up. Your anger may be misdirected. 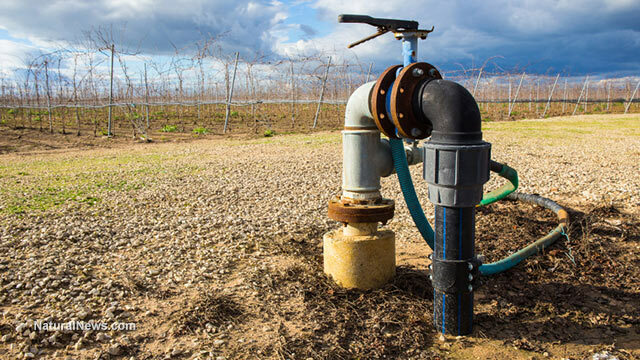 With the focus squarely on the agricultural industry, beverage companies have been allowed to silently bottle public water with very little oversight. In fact, water bottle companies like Arrowhead require a permit to extract water from public land, and they have been without a valid permit since 1988! According to The Desert Sun, Nestle's permit to transport water across the San Bernardino National Forest for bottling has also been expired since 1988. The U.S. Forest Service has indicated that they will make it a priority to reassess the permit and possibly impose some restrictions due to the severe drought. Another investigation that was published by The Desert Sun in 2009 showed that Nestle Waters halted submission of annual reports to local water districts about how much groundwater they removed for their bottling operations. Rounded estimates provided by the San Gorgonio Pass Water Agency have concluded that approximately 244 million gallons of water was removed by Nestle per year! This favor given to water bottling giants has infuriated activists, to the point that they have collected over 27,000 online signatures demanding Nestle stop bottling and profiting off California water, and were also reported to have blocked the entrances to Nestle's bottling plant in Sacramento. Although the amount of water extracted by these water bottle companies is small compared to the agricultural industry, it's important to understand that this type of favoritism given to corporations is a perfect example of how "big money" gets a break and farmers and residents get the shaft. This gives corporate big shots a God-like complex and furthers their narcissistic mindset at the expense of the public good. A perfect example of this is Nestle Chairman Peter Brabeck-Letmathe, who believes that "access to water is not a public right." It's this kind of mentality, and billions of dollars, that has allowed companies like Nestle to do exactly what they want. The most frightening aspect of this water snafu is the precedent it sets. Instead of serving the interests of the general public, governmental authorities continue to be bosom to bosom with high-end corporations. It's not difficult to surmise that in a worsening water shortage, your hot showers and gardening water will get shut off, while Nestle cruises the California highway with no limitations, no reporting and no permit. One has to wonder, if a severe water shortage occurred across the country, whether Nestle's executives would have to cut back on their water usage or if they could just bypass the problem by showering in their illegally extracted water, as government officials lounge at their poolside with a cool glass of spring water. And that, my friends, is the real problem with California's water crisis.